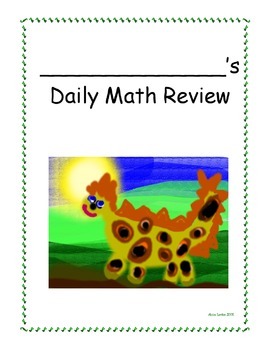 I used Daily Math Review as morning work for many years. Many of my colleagues still do! If you do or like me have created your own, this can be added to the front cover to motivate your children so they want to open their folder and begin! This is a high pixel JPEG. It can be downloaded in color to an Avery 5165 sticker. It also works to use any print paper and glue it on the front cover. The Avery website is free if you would like to create an account and print from there. Otherwise it can be printed from most software programs. This art was created by me for my Second Grade Children in Adobe Illustrator. Doing art and having it around us as we teach and learn makes for a very happy day!